Runners in the greater Dallas, TX communities can participate in fun 5K races and runs throughout the year, many of which have holiday-specific themes. With Halloween just around the corner, it should be no surprise there are options like running in the Fort Worth Monster Dash or the Spooky Cross Country 5K. No matter which course you find yourself on, you can certainly have a great time on the trails while trying to set your new personal record. Of course, as you are logging those miles, your feet are busy with a biomechanical function known as pronation. When some people hear this term, they may think that it means there is a problem with the way their feet move while they walk or run. This likely stems from the fact that the concept is usually only mentioned when there is an issue. For individuals who have a normal gait style, this biomechanical process is simply your body’s way of absorbing the forces that come with walking and running and help propel you forward. 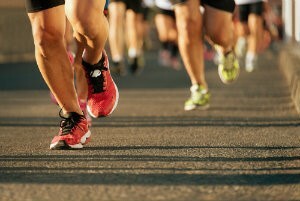 Pronation actually refers to the natural, inwards rolling motion that a foot goes through during the course of a step. It starts with the heel strike and continues all the way through to the final push off from the toes. While it is a natural part of the gait cycle, doing so either excessively or not enough is abnormal and can lead to issues. We find that many times over- and under-pronation (also called supination) happen as a result of an inherited foot structure relating to the height of the arch. Foot arches that higher than normal tend not to roll as much as they should, whereas those that are low are often contributors to overpronation. There are measures that can be taken to help control the motion of your foot, including wearing motion-control running shoes or custom orthotics. Shoe manufacturers have different styles to accommodate those who need to pronate either more or less while running. Orthotic devices can be especially helpful because they are customized for your unique feet and take into consideration your existing gait pattern. If pronation issues are causing issues for you, or you’d like to learn more, contact Richardson Podiatry Associates and we can provide the help you need. Give our Richardson, TX office a call at (972) 690-5374 or fill out our online form to request your appointment with us today.